A ten-minute flight or 30-minute catamaran ride from Tahiti followed by a 25 minute drive from the Airport or Ferry port will bring you to this magical island Resort that is the definition of a South Pacific escape. 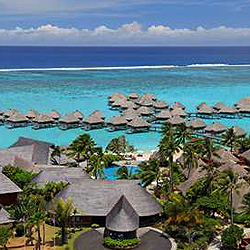 The Hilton Moorea Lagoon Resort and Spa is nestled between two bays on the heart-shaped island of Moorea. With velvety green mountains as a backdrop and a crystal clear ten-acre lagoon embracing its edge the island's only all-bungalow resort commands the most idyllic ocean front location. 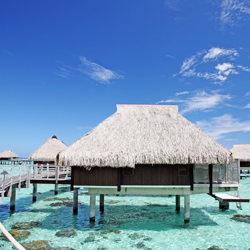 The Resort offers modern convenience balanced with luxurious exotic wood interiors to create a relaxing Polynesian experience from the over-water to beach and garden bungalows. Gust rooms and over the water bungalows are equipped with bath and separate shower, air conditioning, slippers and bathrobe, bidet, black-out curtains, chaise lounge, dining table and chairs, large arm chair with ottoman, LCD Flat Panel TV, seating area with sofa bed, work desk with adjustable lamp, bathroom amenities, coffee maker, hair dryer, high speed internet access, iron and ironing board, mini bar, phones with voicemail. Beauty salon, business center, car rental desk, concierge desk, florist, foreign currency exchange, gift shop, guest activity/recreation desk, laundry/valet service, lounge, multi-lingual staff, on-site convenience store, room service, safety deposit box, tour desk. Arii Vahine offers over-water breakfast & dinner serving French, American and other international gourmet creations. Rotui Bar & Grill is near the swimming pool and beach provides casual lunch. The Toata Bar is an over water natural aquarium crepe bar. Infinity swimming pool, tennis court, scuba, outrigger canoe, pedal boat, kayak, water skiing, jet sik, parasailing and snorkeling. Mandarin Spa offers a variety of exclusive treatments including 50-minute Tahitian Sun treatment and the 2 hour Moorea Indulgence with its seawater and island food bath, vanilla body wash, coconut body scrub and Polynesian massage. In-room massages also available. The spa also includes a sauna, a hammam and hair salon. Promotions Include: Stay 5/Pay 4, Early Saver Bonus, Early Bird rates, and Honeymoon rates with champagne. Ask for details!